Joint pain can have a devastating impact on the lives of people who suffer from it. This disabling condition comes in many forms ranging from more serious ailments like gout and arthritis to the far more common, but often equally as painful condition of stiff joints throughout the entire body. As we grow old our joints naturally accumulate calcium and other minerals that can cause them to become stiff, especially in the mornings after lying still throughout the night. Apple cider vinegar is a natural fermented liquid that can help people suffering from joint related issues in a number of ways. It's rich in minerals, including magnesium, potassium and phosphorus. Deficiencies of these minerals are known to worsen joint pain. Potassium is especially useful as it helps to reduce calcium build up around our joints. As well as minerals, raw, unfiltered apple cider vinegar contains a large selection of beneficial enzymes and natural acids that help to improve our digestive health. Simply including apple cider vinegar in your diet can increase nutrient absorption, a factor which plays a vital role in the health of our joints. Another contributing factor to joint pain and arthritic conditions is the accumulation of toxins stored in the metabolic tissue of our joints. A substance in apple cider vinegar known as pectin helps to flush these toxins from our body, stopping the accumulation reaching painful levels. Most common areas for joint issues. 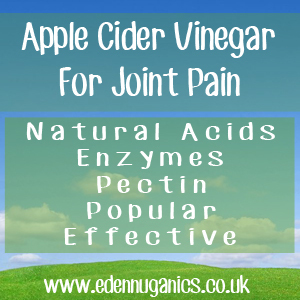 How to use apple cider vinegar for joint pain? Topical treatment - Using ACV as a topical treatment is an excellent way to get straight to the problem area. Simply soak a clean cloth in a 50-50 mixture of apple cider vinegar to water and apply it to the problem joint. Allow the cloth to sit in place for around 5 minutes. Repeat this up to 3 times a day. The shot - This is the most basic way of including AVC in your diet but be warned, it is a good idea to have some form of chaser to hand as the natural acids found in the vinegar will cause a burning sensation when swallowed. Warm drink - This is the most popular method of including apple cider in your diet and with good reason. This warm morning drink not only contains all of the amazing benefits apple cider vinegar can offer but also tastes great! Simply mix warm water and honey then add two tablespoons of raw apple cider vinegar and enjoy. Turmeric & Ginger - Turmeric and ginger both possess powerful anti-inflammatory properties. These two ingredients can be combined to make a great tasting tea that is reported to be hugely beneficial to those suffering from joint complaints. Blackstrap Molasses - Blackstrap molasses is actually a by-product of refining cane sugar. This amazing natural sweetener contains a broad spectrum of essential vitamins and minerals that help to remove toxins from our joints and leave us able to move more freely. Magnesium - Magnesium is essential for our bodies. However, it needs to be acquired through diet or supplementation as our bodies lack the ability to make this mineral. Magnesium helps to relax our muscles and increase the strength of our bones.